I posted the corrected file in the other thread. 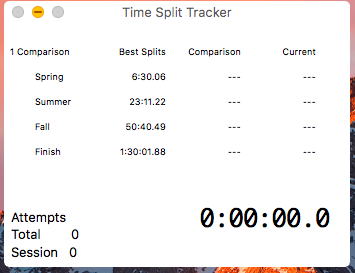 For reference to anyone else with this happening, the first time column is reserved for the best splits, and is stored as the elapsed time for the individual split only. The last column is the one used as the best run, which is stored as the run time. You can optionally insert columns in-between which are comparison splits used as information only, and is not modifed by a best run. They are also stored as the run time. An example for this is when you want to compare your best run against a world record. You put the WR in the middle column and your best run in the last. When you are running, you can see how the current run compares to both your best run and the WR. Thank you so much, this really helped me. I was trying to get this to work since this speedrun is really not optimized at all so I wanted to take the record. 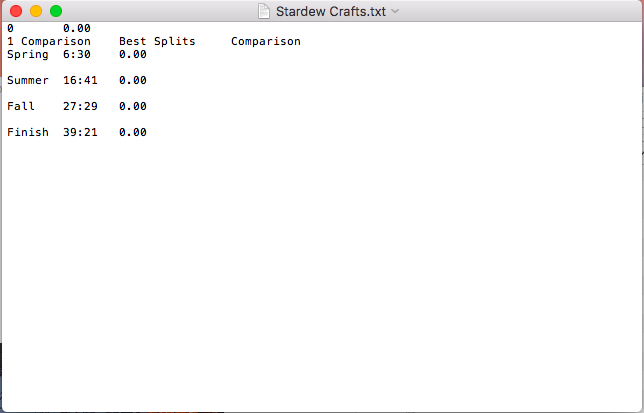 The comparison splits are actually the WR splits so maybe when someone takes it from me, I'll do that. Thanks again!